Deputy Mayor of Galway City, Councillor Mike Cubbard, with Micheal Duffy. The 2017 Galway City Tidy Towns and Garden Competition Awards Ceremony was held in The Menlo Park Hotel on Monday evening. 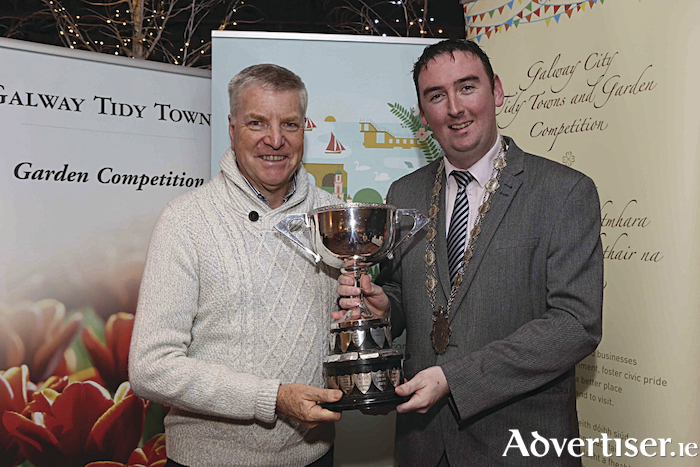 The awards were presented by the Deputy Mayor of Galway city, Independent councillor Mike Cubbard. Deputy Mayor Cubbard congratulated all the prize winners on their commitment to the competition and their contribution to Galway city. The competition encourages citizens to take a greater pride and interest in their gardens, and thereby enhance the appearance of the city. The competition sponsors are the Galway City Council, Dangan Nurseries, Galway Crystal, and Liam Madden, Maddens Nurseries.